It’s been quite a busy and eventful week with some really great moments. First of all, I want to send out a big “Thank You” to everyone who visited my booth at last Saturday’s Night Market in Market Square. If you haven’t yet visited the Night Market, you don’t know what you’re missing! 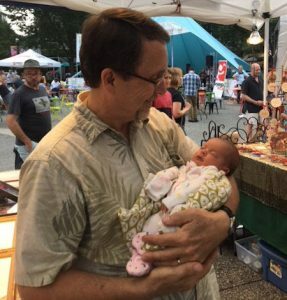 For me, after a long summer of being wrapped up in family matters, I was happy to be out in public again, meeting people and talking about art. It felt wonderful to finally be stepping out… but I wasn’t the only one! 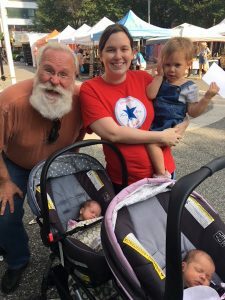 The twins made their first public appearance at the Night Market on Saturday, which was a fun surprise for Tom and me. Santa (perhaps traveling incognito on a pre-holiday scouting mission?) also surprised us with a pre-season visit! We were really excited to get our first photo of the season with him. This Saturday, August 25th, I’ll be back again at the Night Market in Market Square, Downtown Pittsburgh, from 5 to 10 pm. 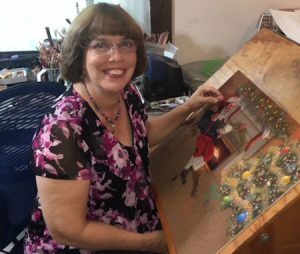 I hope to have some exciting new gift items to show you that I’m introducing for the 2018 Holiday Season. I will also have progress photos of the new Santa painting to show any of you who stop by my booth. All you have to do is ask! As summer heads into the home stretch, I hope you have a chance to get out and enjoy it… and perhaps come and see me at one of my shows. For those of you who live outside the Pittsburgh area, I really enjoy your emails. I hope one day I have the opportunity to meet you! If you happen to find yourself visiting Pittsburgh, please don’t hesitate to contact me. Perhaps we can even find a way to meet in person. Have a wonderful week, and may our paths cross someday soon! ‹ Back in the Saddle Again!